I just returned from my trip to Thailand (where Heidi and I got married) and Korea (where we honeymooned). That’s all that I will post here for now. Phat Studio (our wedding photographers) have an online gallery and we have even more photos for those interested. Thanks to all friends and family for making the wedding (and preceding week) such a warm and memorable experience. Author NickPosted on Friday, 29 May, 2009 Categories General7 Comments on Married! I’m off to Thailand for a while (and then onto Korea). Author NickPosted on Sunday, 10 May, 2009 Categories GeneralLeave a comment on Off to Thailand! I’m not taking part in the current GameJam since I have other things currently occupying my time (eg. getting married in Thailand). However, I did document a design for the game that sprung to mind when I heard the theme. The quote “A journey is best measured in friends, rather than miles.” and (any two of) the words: “Sheep”, “Scorched”, and “Reflection”. I immediately imagined a screen split in two, with the bottom half being a pseudo-reflection of the top (conveying slightly different information). An animal running along the line between the two, gathering friends and avoiding enemies. Finally, the score would be the number of steps taken on the journey (distance counts, but the number of feet, hence friends, would be more important). That was the general idea. 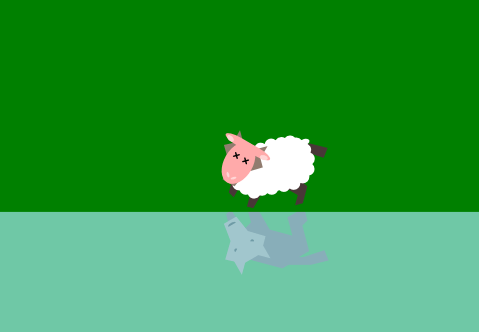 I refined it from there to integrate the “Sheep” theme. 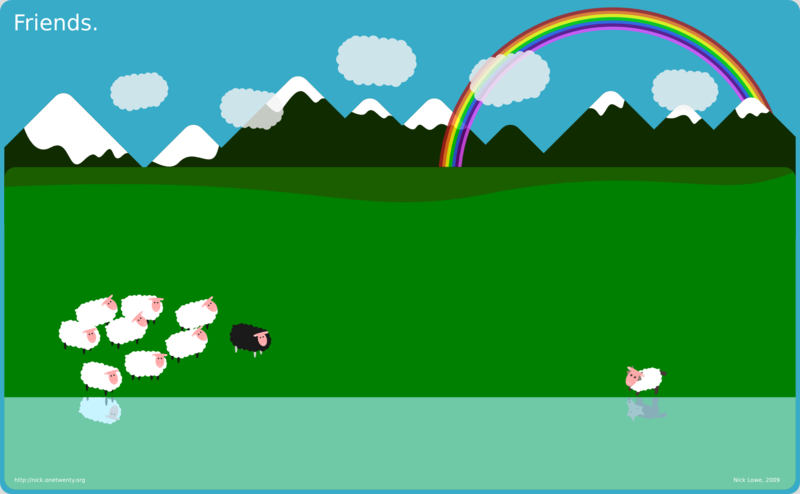 You see a rainbow behind a field with a black sheep near a stream. 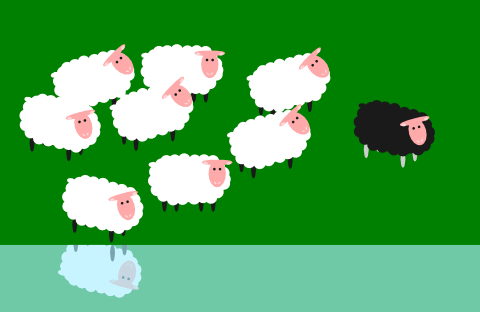 The black sheep walks to the right; You can move it vertically. Sheep are grazing; When near a sheep, they follow it. A grazing sheep may be a wolf in disguise; Try to avoid it! A rainbow appears. Its size relates to the peak size of the herd. 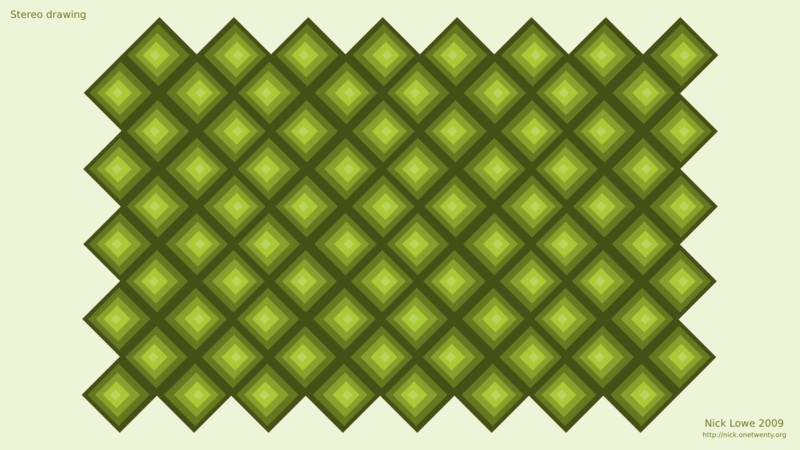 And here are some graphics that I threw together in Inkscape. If anybody wants the SVG file with these graphics let me know. I’m not sure that this game is interesting enough to invest time into making it, but maybe the graphics are useful. My fascination with 3D graphics started in primary school. I had book of red/blue anaglyph images. I quickly figured out how they worked and how I could make my own. I created my own anaglyph images based on simple perspective drawing of basic geometric shapes, such as cubes and pyramids. I was pretty happy with them, but I disliked that glasses were required to view them. In order to create 3D images that didn’t require special glasses, I developed with a few techniques for viewing and creating stereo images. I learnt to stare past the paper to focus on stereo pairs and I used tracing paper and mirrors to help me draw 3D pictures. My favourite technique was to draw overlapping line drawings of pyramids. It was quick and easy to do with a mathematical stencil ruler. I would just draw slightly offset squares in semi-regular grids in order to create a sequence of pyramids that burst out from the page. I’ve started revisting some of these old techniques with my favourite vector drawing program, and I want to integrate more of this style of art into my other artistic works. You should be able to view this image in 3D much like a regular (computer generated) autostereogram (ie. look past the image). Don’t expect anything fancy though! Note: for some reason it takes a little while for one of the legs to pop into place. I was originally inspired by the clockwork horse kinematic sculpture which I saw a video of. The final design is more directly based on this video of a matlab simulation of one of Theo Jansen‘s fundamental Strandbeest designs. The theme for the current GameJam is “A journey is best measured in friends, rather than miles.” and one of the following three words must be used: “sheep”, “scorched”, and “reflection”. I imagined: a mechanical sheep walking along a beach, collecting other sheep as it gathers pace; the reflection in the water indicating wolves in sheeps’ clothing (to be avoided); the total score being a count of footsteps taken (rather than overall distance). The more sheep the more footsteps. I’m not sure if I will take this any further. I love how light-hearted it is and also that it all plays out in a fixed amount of time. Everything is transient: why don’t more games embrace that? Today is the last day that I will be manning the Snapshot Exhibition, so it’s a good day to stop by and check out my of photos of Japan! The exhibition is at kindly hosted by YMCA Headquarters in Leederville, and I’ll be there from 10am to 4pm. 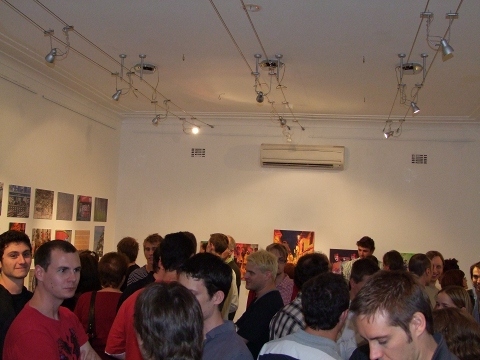 Opening night was last Friday, and there was a fantastic turnout. People were kind enough to move through at a steady pace to ensure that everyone could see everything, and there were quite a lot of sales. My motivation for this exhibition was to express my travel experience in Japan in a fairly concentrated format. I wanted to create something that people could look at and think “oh that’s…!” if they have been there or “what is that?” if they hadn’t. It was great talking to people on the night. Scott (who lived in Japan for some time) said something like “it’s like you have picked my brain for memories” and many people expressed that certain photos were “structured and layered, yet natural” or “very modern” or “very traditional”… which is how I feel about Japan. There is a story behind each piece, and I’ll be free today to talk more about them. Simon manned the exhibition yesterday and it was very quiet, so please drop by for a little while today! Today is also that last day that we will be processing sales at the venue, so it’s also a good day to stop by if you are interested in purchasing any of our pieces (mine or Simon’s). Update: Left a little early because YMCA wanted to closed up (sorry if we missed you! ).